Pier to Full Moon Party Koh Phagnan: only 5 min. 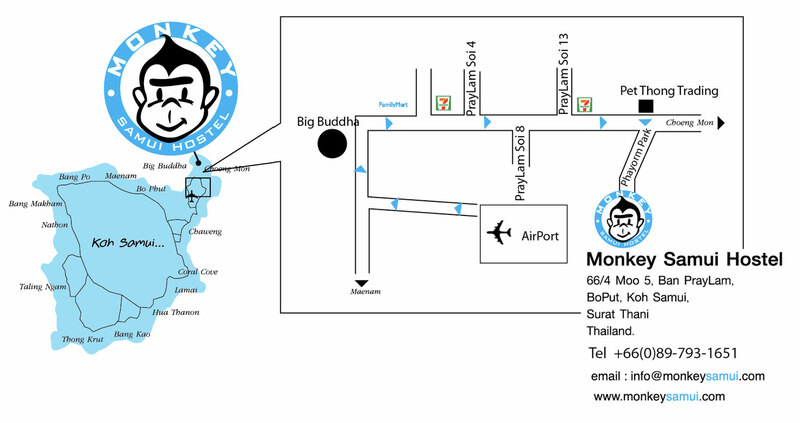 from Monkey to Pier for Full Moon Party Kho Phangan by Monkey Taxi. Big Buddha: 15 min. by walk or 5 min by bike. Choeng Mon Beach: 10 min. by walk / 3 min by bike. Bo Phut (Fisherman Village): only 25 min. by car. Koh Samui is an island of natural beauty and charm, A place where you can have your holiday anyway you like it , kicked back and relaxed or active and fast paced. Beautiful white sand beaches, clean, clear warm water, lush tropical gardens and gentle ocean breezes await you at this ideal holiday destination. There are many trains running throughout the day from Bangkok to Surat Thani and return. The Surat Thani train station is about an hour from the ferry pier where you catch the boat to Kho Samui. 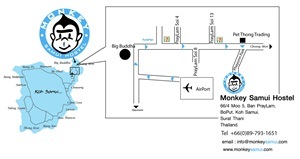 All buses for Kho Samui leave from the Southern Bus Terminal in Bangkok. There are different classes of buses running between Bangkok to Koh Samui. The most popular way to get to Koh Samui among tourists. Take bus from Khaosarn Road. Tickets for bus and ferry sale in package.